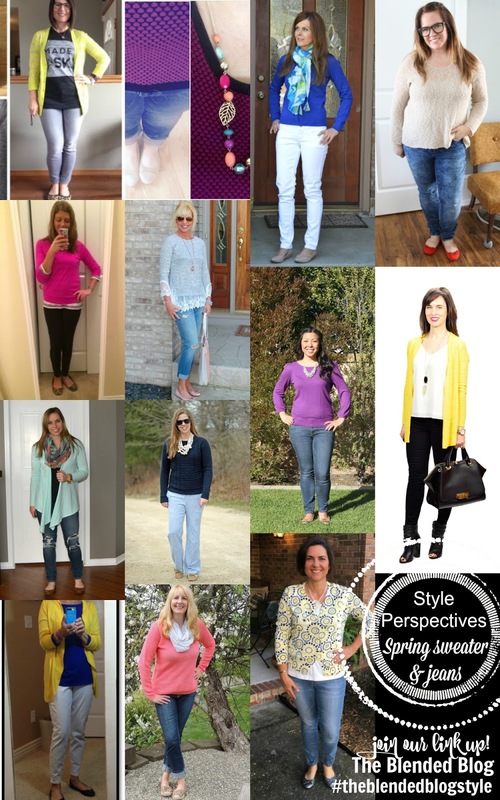 Happy Hump Day and thanks for joining us for week 7 of the Style Perspective Series. 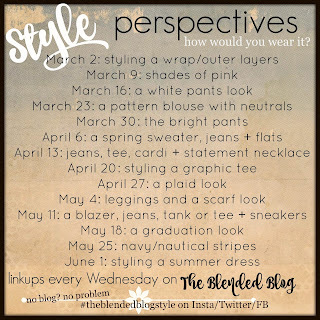 First, let's take a look back at week 6 outfits put together by the ladies of The Blended Blog. Congratulations to Vanessa and Brenda who scored the 2 most clicked links on last week's spring sweater prompt. I love now Vanessa stepped out of her comfort zone with the orange sweater and leopard flats. Brenda did a little pattern mixing with something she would wear consider her uniform year round. I see that leopard flats were a popular choice! not too long ago that I wore only big bold pieces, now I've expanded my repertoire to include many dainty and longer necklaces. The outfit I chose I call my weekend uniform. 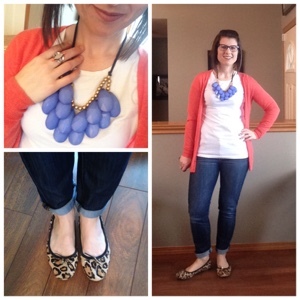 I chose to style the biggest boldest necklace I own with jeans, a plain tee and a cardigan. 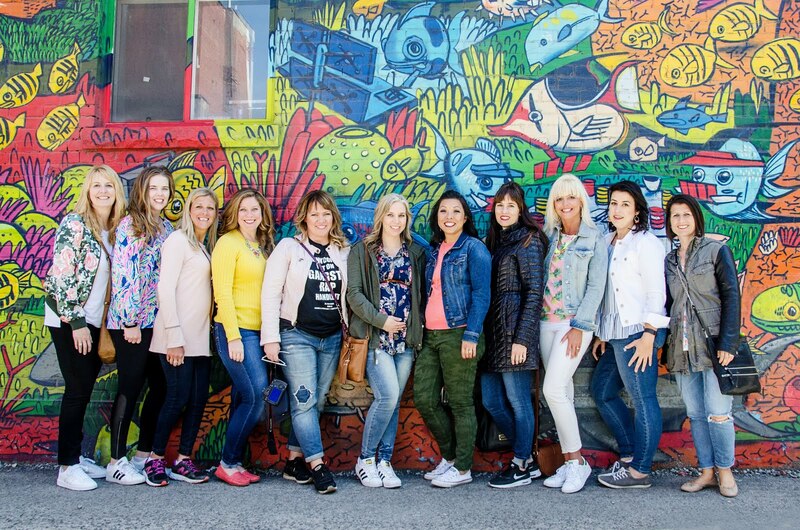 It meets certain criteria that are important to make it weekend wear and also something I feel good in. 1. The shirt is cotton and can easily be washed. When you are surrounded by boys that play outside and wipe their hands on you instead of themselves, you must be able to throw everything in the washer. Can you believe I went more than 3 years without wearing a sweater for this very reason? Just keeping it real. 2. Must have an outer layer. I am cold. I wear sweatshirts in the summer and bring a jacket to tropical destinations. Since the T shirt is short sleeved, I throw on a cardi for warmth. When I was on my sweater hiatus, this layer would be cotton as well. I've graduated to sweater cardis on the weekend. 3. Color mixing. While I could have chosen a blue cardi to pop and to match the necklace I opted to contrast it with the orange. Another thing I could have done is a printed cardi. I like pattern mixing as well so color mixing adds a little extra interest for me. 4. Flat and fun shoes. I just can't bring myself to wear my runners out and about. Converse would be a different story, but I don't own a pair. Yet. These Sam Edelman Leopard print flats are by far my most worn shoe. Followed closely by my neutral flats which I wish were Sam Edelman Felicia flats. 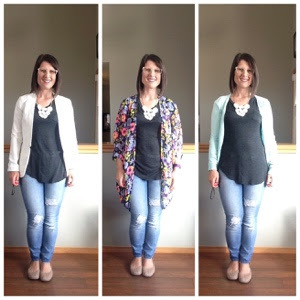 I did a little experiment to show you how easy it is to go from simple to sassy with a statement necklace and an outer layer. 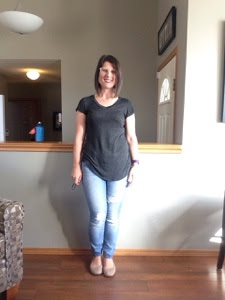 Here I am in jeans and a plain grey T shirt. While the outfit is OK, I am certain it can be better. By adding a statement necklace and a completer piece the outfit is Christy approved and ready for the weekend! Well except for the blazer, I wouldn't wear that on the weekend unless I was leaving the house without the boys. What is YOUR weekend uniform? Would my weekend uniform be something you would consider wearing for your weekend activities? We are styling statement necklaces today. The style posts which feature our selection of the week (statement necklace) will be featured on Instagram and pinned on Pinterest. Please visit at least one other post in the link up and get to know one another!